I’m sure you’re heading down the Christmas gauntlet this week: Last-minute gift wrapping, trying to find that pan you cook the ham in, trying to keep the brittle tree needles from going up in a flash of smoke, finishing up angel wings made of coat hangers and pantyhose for the school play. Hey, if you’re struggling with the tension between the secular and sacred aspects of the holidays, or if you’re ready to just have the whole thing over, breathe easy. There’s nothing special about the 25th of December, anyway. Jesus was actually probably born in the springtime so the 25th of December is really an arbitrary date. But still, having a special holiday to remember the day God sent His only begotten Son into the world is fine by me. But the gifts of Christmas are not a one-day event. The amazing gifts Jesus brings are available 24/7/365. This might be a bit awkward, but try to think of the Holy Spirit as the Christian'strue Santa Claus. The Holy Spirit comes and lives inside you, and He brings this HUGE bag on His shoulders full of spiritual blessings. In Christ, the Holy Spirit gives you holiness, righteousness, and wisdom. He offers you this huge bowl full of spiritual fruit that includes love, joy, peace, patience, etc. – all the stuff that you really truly want. The Holy Spirit even has a list of spiritual gifts in 1 Corinthians 12 that He gives to you at His discretion: wisdom, knowledge, faith, healing, miraculous powers, prophecy, and more. Today and every day, may your heart be open to receiving these incredible gifts that He gives! Holy Spirit, thanks for the packages, and the lights, and the music in the pageants, and the kids, and everything. But mostly, today, I thank You for You. Thank You that You are in me, that You continually lavish Your gifts upon me. Amen. 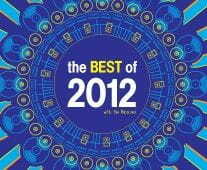 Live a Transformed Life with ‘The Best of 2012’! This year, there were six Telling the Truth messages that really helped a lot of listeners around the world. That’s why we’ve now put these messages into a special collection for you called The Best of 2012. We want to help you dig into God’s Word and live a transformed life in Him! The messages in this series cover a lot of ground, but the common thread running through all of them is that you can have joy and abundant life in Christ no matter what you’re facing today. This resource is our gift to thank you for your gift of any amount, so please request your copy today!